[Leonard Welsted, poet and 'Dunce'] Autograph Signature "Leond Welsted"
Piece with signature cut from larger document, c.9 x 3cm, edges indiate it's the bottom left of a document, part image, decorative, of a key and the letters ML with his signature beside. Note: Welsted married a daughter of Henry Purcell, antagonistic towards Scriblerians etc. See DNB. [ Edward Knoblock, playwright and novelist. ] Unpublished typescript of 'The Great Exhibition | A Play in two Acts | with songs of the Victorian Days | by | Edward Knoblock'. With a Typed Note Signed from Joan Ling Ltd to W. J. MacQueen Pope. 21 Ashley Place, SW1, under label of Joan Ling Ltd, London. Without date. 137pp., 4to. Typed text on rectos only. Bound with red ribbon into red wraps, with typed label on front cover. In fair condition, aged and worn, in heavily-aged wraps. Pencil annotations to the list of characters. Bound in before the beginning of almost every scene is a manuscript leaf carrying a page giving the layout of the set. The label of Joan Ling Ltd, Gloucester House, 19 Charing Cross Road, WC2, is pasted over Knoblock's typed address 21 Ashley Place on the title page. Knoblock's papers are at his alma mater Harvard. [Hannen Swaffer and Walter Macqueen-Pope.] Collection relating to an abortive collaborative attempt at a 'biography' of Swaffer for Odhams Press, with drafts of chapters (with anecdotes on Churchill, H. G. Wells, Lloyd George) and original letters. In very good condition, on aged paper, in a brown card folder. The material in this collection relates to a book that was never published, and included here are copies of two typed letters from WMP to HS, casting light on the nature of this doomed collaborative project. In WMP's first letter, dated 26 July 1955, he writes to 'Dear Swaff' to 'finalise the manner in which your book is to be written'. Presaging future problems he urges him: 'I do entreat you to remember the fact that a book is different to a series of paragraphs. It must have cohesion. [Roy Hopkins, editor of 'Old London' magazine.] Typed Letter Signed to the Trustees of Dr Johnson's House, regarding 'the last article written by the late Lord Harmsworth', on Dr Samuel Johnson. With copy of the first issue of the magazine. Letter on letterhead of 'Old London | (Old London Magazine)', 51 Chepstow Place. 9 September 1948. Magazine: vol.1, no.3 (Summer Number), 1948. Letter: 1p., 12mo. In fair condition, foxed at head. He informs them that the article was on Dr Johnson's house, and will be published in the magazine's 'Autumn Number', writing: 'If I send you the proofs would one of you care to write a few appreciative words on Lord H? I shall add a short biography culled from The Times'. In an autograph postscript he requests 'an old wood-block or a stone-litho which I could reproduce in O. L. of Johnson's House'. Magazine: 46 + pp., 12mo, in printed wraps. With foxing and pinholes to cover. Includes articles by W.
Autograph Letter Signed ('John C Hamilton') from John Church Hamilton, son of founding father Alexander Hamilton, to the poet Col. George Pope Morris, regarding disputed points following the sale of his house [Undercliff, Bull Hill [Mt Taurus], NYS]. New York; 4 July 1835. 3pp., 4to. 74 lines of text. Originally a bifolium, but with the two leaves now separate. Good, on aged and lightly-worn paper. Addressed, on reverse of second leaf, to 'George P Morris Esq. | Cold Spring.' The reference in the letter to Morris having 'cut down the wood' around his property is ironic, given that he is most famous for the poem/song 'Woodman! Spare that Tree!' Hamilton begins by stating that he has seen 'Mr. Robinson', who will see Morris on the subject of buying Morris's house. Hamilton considers Morris's price of $8000 for his house 'very cheap'. Autograph Letter Signed ('J. Boaden') from the playwright and biographer James Boaden to William Hayley, regarding an edition of Randolph's works 'honour'd by the handwriting of Pope'. Warren Street, London; 30 April 1804. 1 p, 4to. Bifolium. Sixteen lines, neatly written. Text clear and complete. Good, on lightly-aged paper. Addressed on reverse of second leaf to 'W. Hayley Esqre.' He begins by thanking him for 'the kind memorial' (a volume of music? ); the gift expresses Hayley's 'sense of common civility' and acquaints Boaden 'with a composer of great merit'. 'I tried the effect of his divine art yesterday, Sunday, and could not but wish to hear it from the organ at Chichester'. The rest of the letter concerns 'the subject of Randolph, and the copy of his works honour'd by the hand-writing of Pope'. 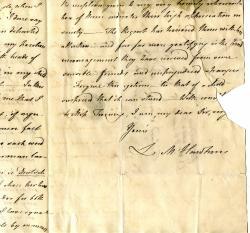 Autograph Letter Signed ('L M. Hawkins') to Richard Twining (tea merchant and East India Company) at Isleworth. 11 December 1811; 'Riverside Twickenham | Friday morn'. 4to, 3 pp. Bifolium. Good, on aged paper. Thirty-nine lines of text. Good impression of red wax seal depicting Alexander Pope. In breaking open letter a 7 cm closed tear made to second leaf, and a small part of leaf torn away, and now under seal, with loss to three words of valediction. Slight glue staining from mount at head of verso of second leaf, which carries address and Twining's docketing. Autograph Letter Signed ('le Cte de Montalembert'), in French, to an unnamed male correspondent. 12mo: 2 pp. Very good on lightly aged paper. Asks if it might be possible, as previously, to forward a packet to 'Mr. d'Abbadie': 'depuis deux ans je suis sans nouvelles de lui'. It is six months since he had the honour of forwarding a similar packet via the French legation at Lisbon. Good firm signature, but with the words '(Le comte de Montalembert)' in another hand beneath it, and interfering with the flourish (paraph). Autograph Letter Signed ('Matt H Bloxam') to Reginald H Pope, Standlake Rectory, Witney, Oxfordshire. 12mo, 2 pp. Very good. Several of the letters of congratulation he received on his birthday were from 'old Rugbeians', and Pope's was 'one of the first'. He has been 'invited by the President and Council of the Royal Archaeological Institute to be President of one of the Sections at their meeting this year at Salisbury but age and infirmity have obliged me to decline'. Although 'not under the Doctor's hands' he feels he is 'going down hill apace'. The previous Tuesday 10 boys from Rugby 'came in to partake of Cake Gingerbreads and fruit 9 of whom were from your old boarding house now Mr.
Autograph Letter Signed "R.F. Littledale" to an unnamed correspondent. (embossed) 9 Red Lion Square, London, W.C., 14 July 1884. Two pages, 8vo, bifolium, good condition. Colonel Hardy, Secretary of the English Church Union, has assured him that his correspondent can help in the matter in hand. Nameky, Dr Von Dollinger has informed him that "Padre Curci" [Jesuit, sometime ed. 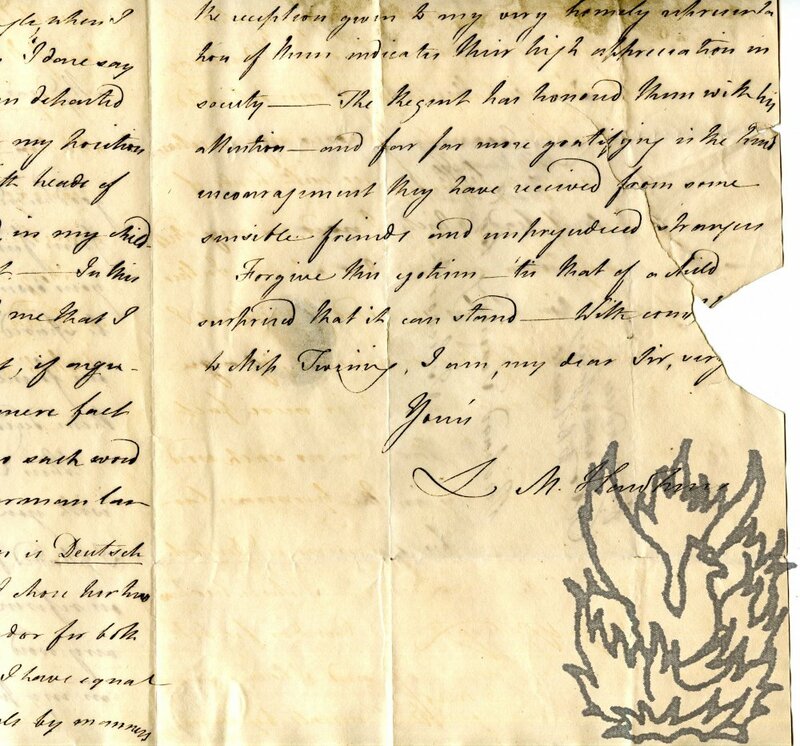 Autograph Letter Signed to James Heywood Markland, with autograph draft of Markland's reply. 12 May 1851; on letterhead 'West Molesey | Surrey'. Politician and essayist (1780-1857). The recipient (1788-1864) was an antiquary and member of the Roxburghe Club. Four pages, 12mo. In very good condition, although rather grubby and with traces of stub adhering to one edge. He finds 'a letter of Pope to Beau Nash transmitting him an inscription [^ (not copied)] for, as I guess, a statue or bust of Fredk. Prince of Wales. Dodington, George Bubb, Baron Melcombe 1691-1762, a Lord of the Treasury, Pope's "Bufo". One page, folio, fold mark, tear, loss of text (including the full signatures formerly below Dodington's), rest of official countersigning, etc. surviving. An order (8 March 1736) to pay £300 from His Majesty's treasure to John, Duke of Montagu (see DNB) "for one quarter of a year due at Christmas 1736 on his Annuity or yearly Pension of One Thousand two hundred pounds . . ."